Iolite (also known as Cordierite) was discovered in 1813 and is named after the French geologist Louis Cordier. However it is said that the Norsemen used blue Iolite to navigate. They used it to determine the direction of the sun on an overcast day. The name Iolite comes from its violet tinge (Greek for violet). Sometimes it's misleadingly called the "Water sapphire". It is transparent and translucent. Iolite is the Leadership stone. It helps with asserting leadership roles and getting accepting as a leader. Iolite is about control, it prevents you from allowing others to walk all over you or for you to allow your emotions to control you.Helps identify and neutralise the martyr or victim of circumstances syndrome.A good stone for helping one find direction in life by enhancing intuition and higher awareness of purpose. Iolite also helps you to release the discord from your life, helps to connect to the soul and understand who we are and why we are here. Promotes truth, enhances inner strength and supports self confidence. 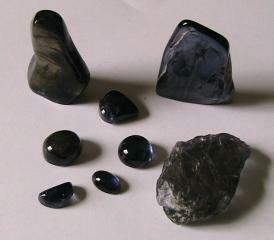 Blue Iolite affects friendships, grey Iolite - professional relationships, purple Iolite -family or sexual relationships. Iolite is associated with the zodiac signs Taurus, Libra and Sagittarius. According to colour. The blue variety activiates Vishuddha, the Throat Chakra ( 5 ) and Ajna, The Third Eye Chakra ( 6 ) The Violet tinged Iolite relates to Sahasrara, the Crown Chakra ( 7 ).